How spreadsheets are messing with your bottom line. They don’t show you real-time data. Business leaders need the ability to take action with the most accurate, current information without waiting for reports to be updated. With Domo, you can pull Excel spreadsheets—along with any other source of data you care about—into a single, intuitive platform. Domo enables you to better visualize your spreadsheet data and share it with anyone in real time. Fill out the form below to read “Still using spreadsheets?" Before you can make sense of all your data, you first have to compile it. 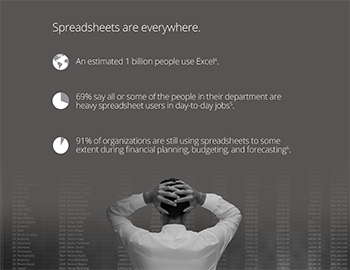 Ventana Research conducted a study examining the use of spreadsheets in business settings, from small-to-medium businesses to Fortune 500 organizations. According to their recent report, users spend 12 – 18 hours each month performing “spreadsheet maintenance”—updating, revising, consolidating, modifying, and correcting spreadsheets. Even executives can’t get away from it: Ventana reports that the front office dedicates an average of 15 hours per month to spreadsheets. After you and your teams assemble data, the analysis begins—and it takes several days. Ventana reports that 81% of business professionals are combining data from an average of five spreadsheets to answer just one business question. Research in the finance department also reveals that 80% of finance leaders say the analysis requires several days, and 75% say their staff is not analytical enough to handle the processes quickly and accurately. With all the time your teams spend focused on creating spreadsheets, you’re burning through payroll and losing valuable time and resources. In the end, today’s business solutions are far better equipped to automate the vast majority of data aggregation and calculations that many teams are still trying to accomplish by hand. An estimated 1 billion people use Excel4. 69% say all or some of the people in their department are heavy spreadsheet users in day-to-day jobs5. 91% of organizations are still using spreadsheets to some extent during financial planning, budgeting and forecasting6. Simply put, spreadsheet errors are costing businesses billions of dollars7. A bank representative used several spreadsheets to monitor how much risk the bank’s London traders were taking. A copy/paste error wound up creating a formula that divided by the sum instead of the average. A $6.2 billion trading loss impacted businesses and economies around the world9. Two hundred cells were hidden—not deleted—in Barclays’ spreadsheet detailing which Lehman Brothers assets to buy. When the spreadsheet was converted to a PDF and sent to the bankruptcy court, all 200 cells reappeared. The bankruptcy court forced Barclays to purchase 179 toxic deals they never wanted in the first place9. At the London 2012 Olympics, a staffer had a one-key-stroke error when entering the number of seats available: 20,000 instead of the actual 10,000. 10,000 tickets were oversold, creating a logistical nightmare and thousands of angry fans10. Getting rid of human error is easier said than done—but it can be done, or at least mitigated. By tying your data sources directly to a platform that can gather data in real time, you eliminate the need to transfer everything through a spreadsheet before it gets calculated and reported. 3. They’re difficult to consume. Fact: You are visually wired. Fifty percent of your brain is involved with visual processing, and you can get the sense of a visual scene in less than one-tenth of a second11. You remember 80% of what you see, 20% of what you read and 10% of what you hear, and color visuals increase the willingness to read by 80%11. Problem: Spreadsheets are not visual. Although the answers to your questions may be found in that gigantic grid somewhere, no one wants to dig through the spreadsheet to find them. Instead of mind-blurring columns, rows, text and numbers, you need visual indicators so you can spot trends or outliers and make revenue-impacting decisions at a glance. The data located in spreadsheets is crucial for your business. But you might be missing key revenue indicators that are hopelessly lost in endless rows, columns and cells. Domo changes the spreadsheet landscape. When it comes to reporting data, spreadsheets are time consuming, error prone, and difficult to consume. And business leaders know it—75% of Ventana Research participants reportedly want to make real-time connections to company data, and 72% want reports that decision makers can refresh or filter themselves5. Business leaders need the ability to take action with the most accurate, current information without waiting for reports to be updated. Domo brings data from any system, spreadsheet or application into a single real-time platform. Decision makers can access the data they need, when they need it, without having to wait on any reports. And it completely transforms the way you manage business. To see how Domo makes your spreadsheet data more valuable.